What others thought to be a mistake over 10 years ago turns out to be big business today. Oskar Blues posts big numbers for 2012 and shows no sign of stopping. Here's a press release on how 2012 went down in Oskar Blues' history books. OSKAR BLUES BREWERY CELEBRATES 2012 WITH THE TEN-YEAR CANIVERSARY OF DALE’S PALE ALE, A 52 PERCENT INCREASE IN SALES AND A NEW BREWERY IN BREVARD, NC. [PRESS RELEASE] Longmont, Colo., January, 17th 2013 – Colorado-based Oskar Blues Brewery, the first craft brewery in the country to brew and can craft beer in November 2002, continued its explosive growth posting a 52 percent increase in sales/depletions and 49 percent increase in revenue in 2012, outpacing industry growth by nearly 40 percent. 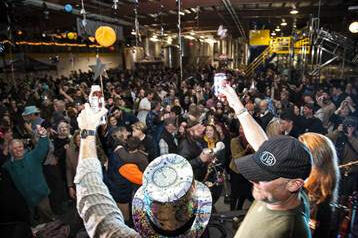 Oskar Blues’ continued growth is a result of $4+ million in improvements to its Longmont, CO facility in 2012. The expansion included 14 additional 200-barrel fermenters and two 400-barrel bright beer tanks which allowed the brewery to go from 59,000 barrels of beer in 2011 to 85,750 BBLs in 2012. In addition, the Tasty Weasel taproom (Best Taproom: 5280 & Westword Magazines) in Longmont, CO underwent extensive renovations earlier in 2012 resulting in a new patio and additional production space. The increased capacity catapulted Oskar Blues to one of the three “Biggest Momentum Gainers” on the Brewers Association annual Top 50 Craft Brewers List this past spring and grabbed them the Denver Business Journal’s “Fastest Growing Private Companies” in August. It also allowed Oskar Blues to expand distribution to new markets for the first time in four years. The markets: Chicago, Ohio, Northern Kentucky and founder Dale Katechis’ home state of Alabama each established the largest craft beer launch in territory history topped with 14,000+ case equivalents during the first week in Ohio. 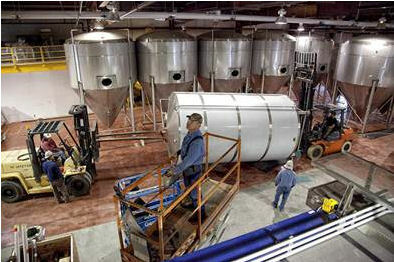 The Colorado brewery also installed a new canning line capable of filling 300 cans per minute. This allowed the company to introduce 16oz cans of Deviant Dale’s IPA and G’Knight Imperial Red IPA while being the first American brewery to offer beer drinkers a 19.2oz. Imperial Pint can. Oskar Blues celebrated the 10 year CANiversary of Dale’s Pale Ale by launching the original craft beer in-a-can in the 19.2 oz. Imperial Pint can package during this year’s Great American Beer Festival. The package is available across the country for 2013. In addition, Oskar Blues became the first craft brewer to introduce Ball Corporation’s 16oz. Alumi-tek resealable can this year at the Craft Brewers Conference by debuting “CHAKA Belgian-Style Ale”, a CANlaboration with Sun King Brewery from Indianapolis. Since that debut, they have used the Alumi-tek can for another CANlaboration with Sun King, a hoppy brown ale called “The Deuce”. They are also canning and distributing their own B.Stiff and Sons Old Fashioned Root Beer in the innovative package. Oskar Blues keeps employees healthy with an “In the Core” workout program 3 times a week with a personal trainer, massage twice a week and Yoga once a week. The outdoor centric company also hosts a running club and group bike rides throughout the year. In 2012, Oskar Blues instituted a 6% matching 401K program and provided employees 100% health care coverage, offerings that earned them the Denver Post “Top Workplaces Award”. The accomplishments of 2012 became a springboard for 2013 when, in December, Oskar Blues began brewing at its new brewery and taproom in Brevard, NC. The brewery plans to include a separate restaurant and live music venue in the small town as well. The addition of the 30,000 sq. foot Brevard brewery will expand overall brewing capacity to nearly 130,000 barrels in 2013 and allow the brewery to enter additional markets. “We continue to have as much fun as we CAN to enjoy this ride” said Katechis. “I am proud of our team as we celebrated the 10th anniversary of Dale’s Pale Ale and we look to include Pisgah, NC singletrack as part of the Oskar Blues backyard.” The fun includes two award winning Colorado restaurant locations (Grill & Brew, Home Made Liquids & Solids), Bonewagon food truck, Hops & Heifers Farm, REEB Cycles www.reebcycles.com (Outside Magazine’s Top 9 Mountain Bikes of Spring 2012) and the upcoming March opening of CHUBurger www.CHUBurger.com in Longmont, CO. Founded by Dale Katechis in 1997 as a brewpub and grill, Oskar Blues Brewery launched their craft-brewed beer canning operations in 2002 in Lyons, Colo. They were the first American craft brewery to brew and can their beer. Today there are more than 200 craft breweries canning their beers. The original crew used a hand-canning line on a tabletop machine that sealed one can at a time. Oskar Blues Brewery in Longmont packaged 59,000 in 2011 and grew to 85,750 in 2012 while opening an additional brewery in Brevard, NC for 2013. Visit www.oskarblues.com for more information. - From farm to restaurant Oskar Blues' CHUBurger plans revealed. - Oskar Blues and Ska toke malt in a CANlaboration. - Oskar Blues and Sun King Canloborate on The Deuce.